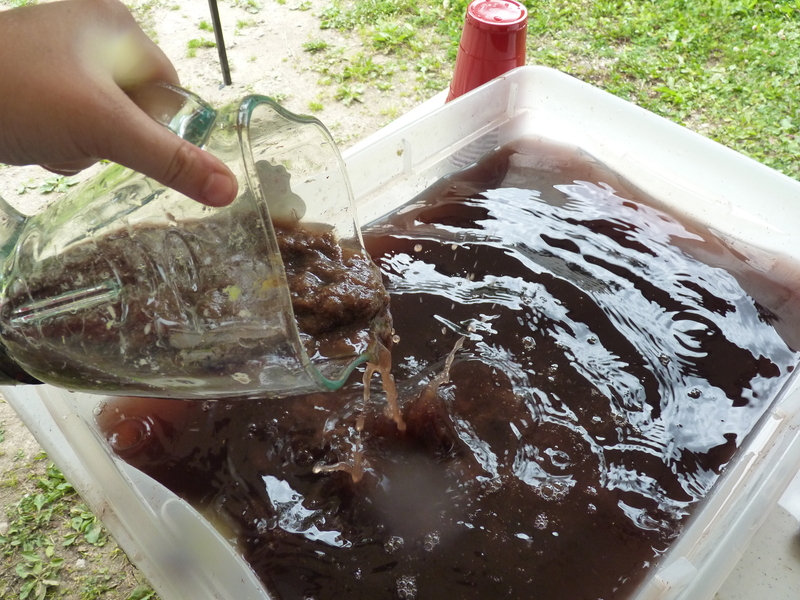 In this amazing workshop we learned how to make handmade paper using locally-gathered cattail fibers and create inks from in-season berries! 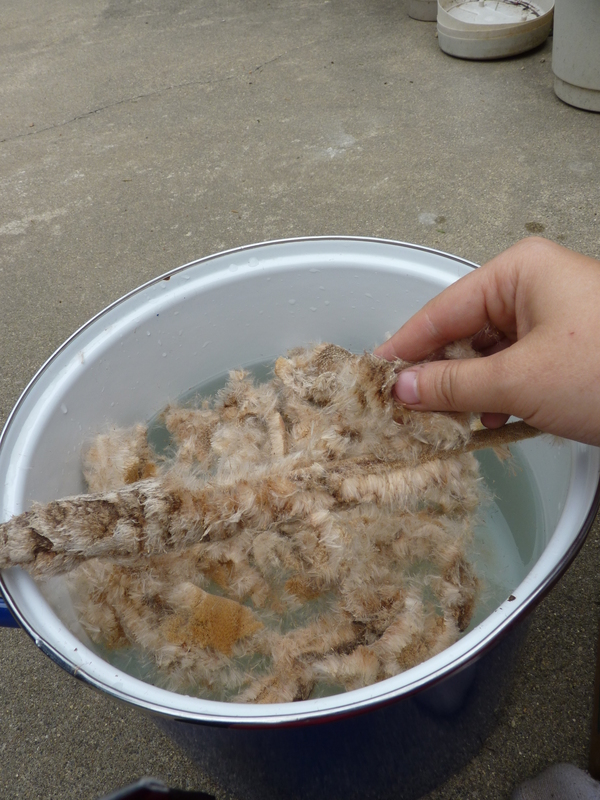 Instructor, Dana Driscoll, who has over 15 years of hand papermaking experience, shared a brief history of papermaking, basic principles and demonstrated how to make beautiful pieces of cattail fiber paper. We also made our own berry inks and experimented painting and drawing with them. Dana discussed ink creation, berries and available colors, preservation, permanence, and different ways to use these delightful inks ! Blog article by Dana Driscoll from her website. 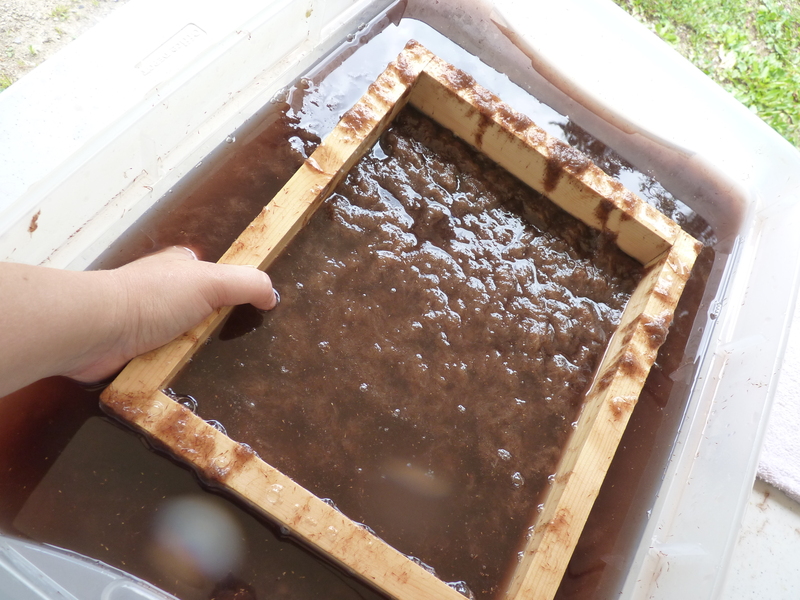 In my last post, I detailed the steps for making handmade paper from recycled materials. 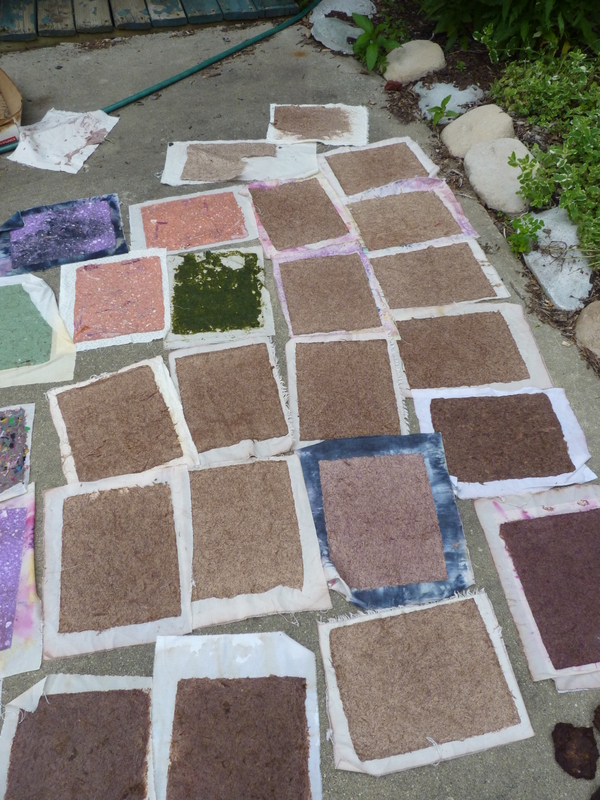 In that post, I also detailed the basic steps of making paper, from blending to couching to pulling and pressing sheets. 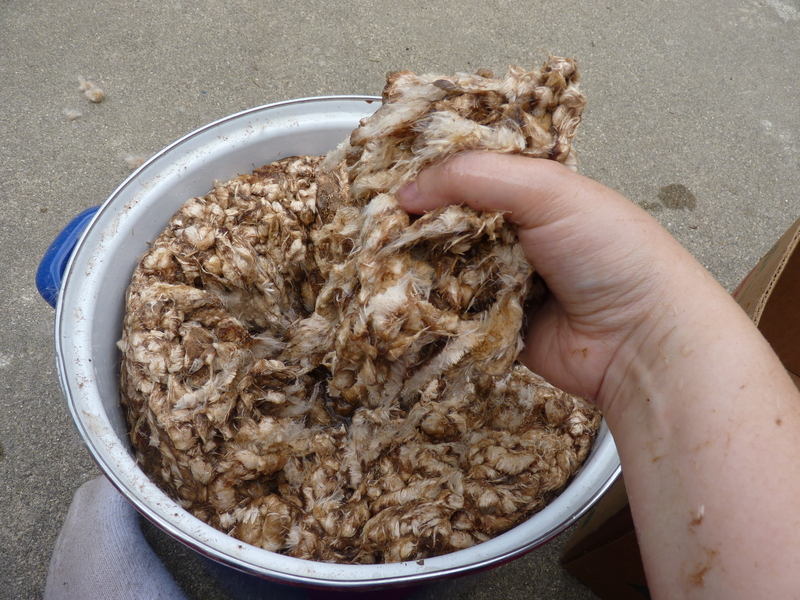 Recycled fibers are a great way to start, but you may find yourself interested in papermaking techniques using nothing but what is available from the land around you. 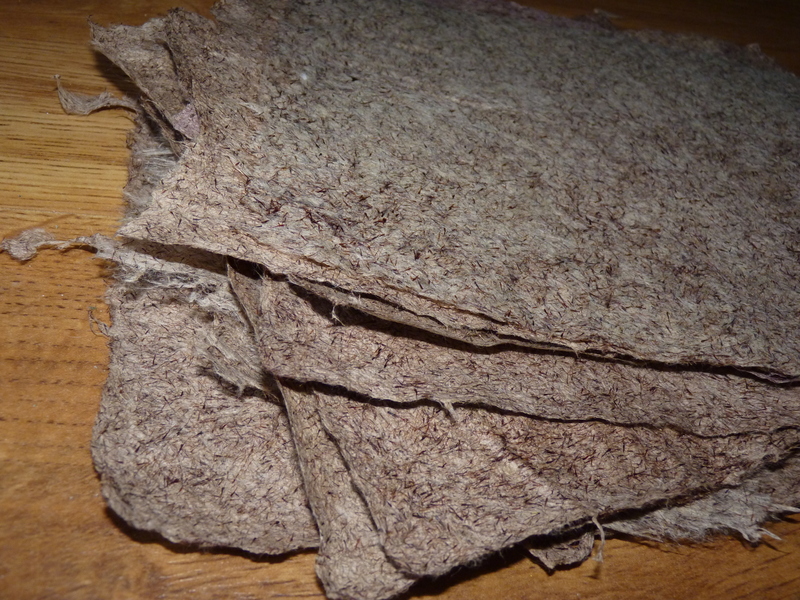 Plant-based papermaking is an advanced papermaking technique, so I suggest you start with recycled papers, and once you are comfortable with that process, move onto this one. I’m going to be using cattail fibers, specifically, those of the flower head/seeds/fluff as an example for this post. You can use a lot of different fibers for the plant-based paper process, including reeds (with hard, woody bits removed, cattail leaves, burdock (the whole plant), various grasses, etc.). We also have a lot of invasive phragmites around here; I have found that their leaves (but not stems) make excellent paper too. Each potential papermaking plant requires a “getting to know you stage” for example, burdock stems make better paper than the leaves, unless you dry the whole thing first. What you want in a plant is some strong fibers so that your paper has strength, but not so woody that stems, etc get into your paper–thick stems won’t cook down in the process I’m describing below. So something like the leaves of reeds, or the leaves (but not stems) of corn work for this. Creating pulp from locally-sourced plants is pretty much an experiential art form, so you really just need to pick the plants, boil them down, make some pulp, and see what happens! But the cattail fibers are a pretty safe bet for your first attempt, hence why they are used as my example here. Do not over-harvest: pick only in areas that have a healthy amount of the plant growing, and leave plenty behind. Don’t ever harvest endangered plants. Make sure you have permission: public lands and state parks are often off limits; gain permission from private landowners before harvesting–chances are, if you share with them what you are doing (or a bit of your end product), they won’t care. You should also ask permission from the spirits of the land. 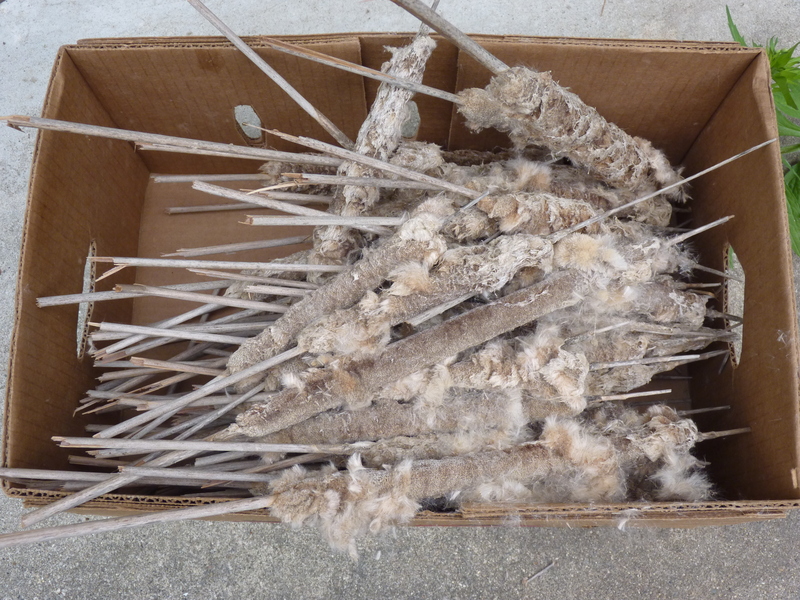 Consider your timing: part of why I harvest the cattail heads in the spring is because the plant is dead; I am just harvesting the seed pods. Be thankful: remember to be thankful for all that you take from the land. In some pagan traditions, people leave a little offering like a silver coin, etc, near the plant. Honestly, I kinda think this is pretty silly. If I’m going to leave an offering in thanks, I do one of two things: leave something that would be edible to wildlife (e.g. some wheat berries or sunflower seeds or apples) or else do something that helps the land (like participating in a river clean-up). Make whatever you are doing in thanks ‘count’ and have an actual, lasting impact. I happen to live in an area with a ton of wetlands, so cattails make a perfect locally-sourced paper pulp. I go out in the spring–early spring is fine–and gather the dried heads from the previous season. You can find them in great numbers along roadsides or near ponds. On a warm spring day, I went out and gathered a large box full of the heads–probably about 40-50 or so of them. 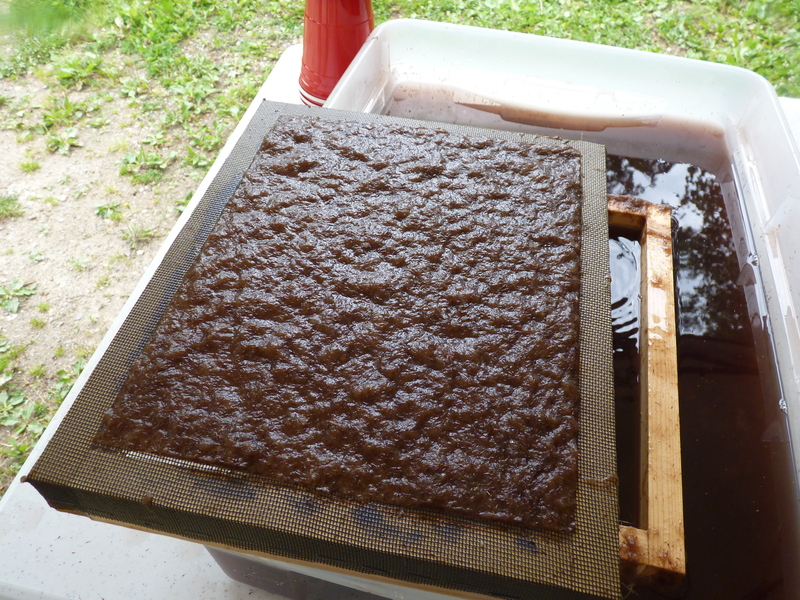 Unlike most foraging, where you have to be concerned about gathering from near roadsides, with papermaking materials you don’t, since you won’t be ingesting any of the materials. I should add that if you are gathering anything in a marshy area, having a good pair of rubber boots is a wise idea. Since you’ll be using something caustic to break down the fibers, its really important that you use a pot that won’t react to strong alkalai. An enamel pot is a good choice for this; I also understand that stainless steel works, but I only have used an enamel pot. Once your cattail fibers are in the pot, you want to add some Soda Ash (usually found in the form of Arm and Hammer Super Washing Soda). Super Washing Soda can be a bit tricky to find; look for it in your grocery store in the cleaning supplies near the laundry detergents. I used to not be able to find it at all in Indiana, so I ordered it online in bulk (bulk because I also use it for laundry detergent and some other purposes). But in Michigan, our local Kroger store carries it. I usually add about ½ – 3/4 a cup to a pot the size of this one; the ratios don’t have to be exact. Mix in your soda ash and bring your concoction to a boil (but not a rapid one, a simmer is fine). Cook your pulp and soda ash mixture for about 3-4 hours; make sure you have good ventilation while cooking (use the stove fan, open window, etc.). Stir it every 30 min or so, making sure it doesn’t burn. I use a wooden spoon for this purpose, as I know it won’t react with the soda ash (but I don’t use that spoon for cooking). As it cooks, you’ll notice that the fibers start to darken. This is because the soda ash is going to break down the non-cellulose content in the fiber—and we want the cellulose, but not the other stuff, for paper. 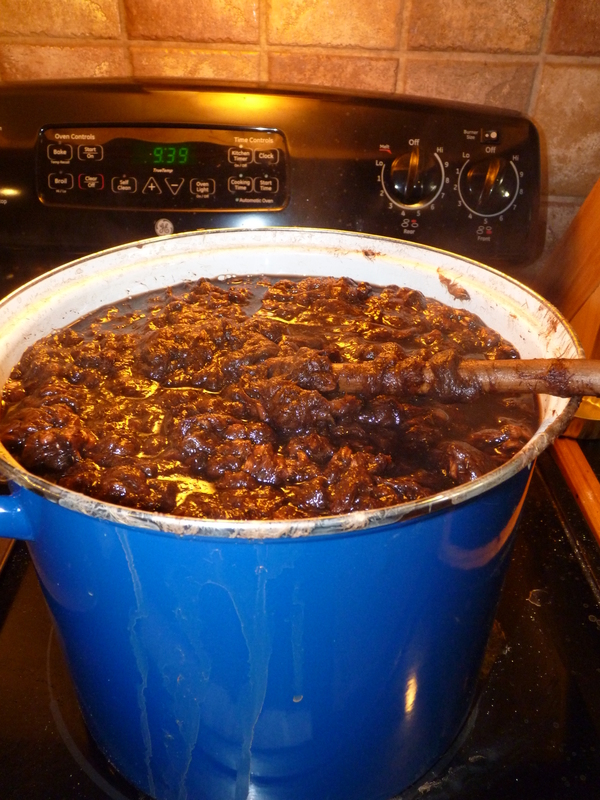 After 3-4 hours turn off the heat and let your pot cool down for a while. Once your pulp can be handled, drain your pot. Put on some rubber gloves and rinse out your fibers so that you get all of the Soda Ash out of there. You’ll need to touch your pulp in later stages, so you don’t want it to be caustic. For this purpose, I usually use a colander or else some cheesecloth—anything that you can rinse and strain the fibers is fine. You can put your fibers back in the pot, adding additional water. They are now ready to make into paper! 1) Blend your fibers: this is especially important with plant-based fibers, even short ones like the cattail fiber. This will give you a more uniform pulp and better results. 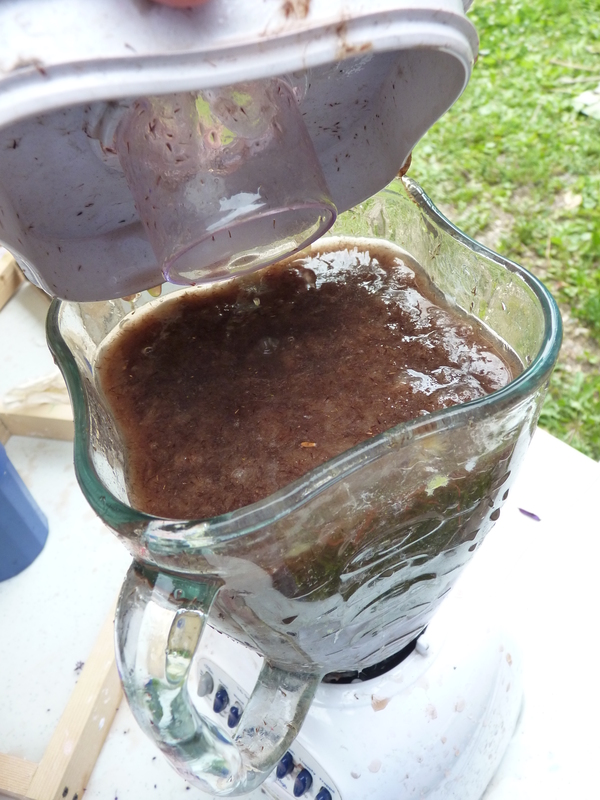 Don’t put too much pulp in the blender at once—its really thick stuff. For some pulps, like reed, you’ll really need to blend for a while. The cattail blends quickly and easily. Some others, not so much. 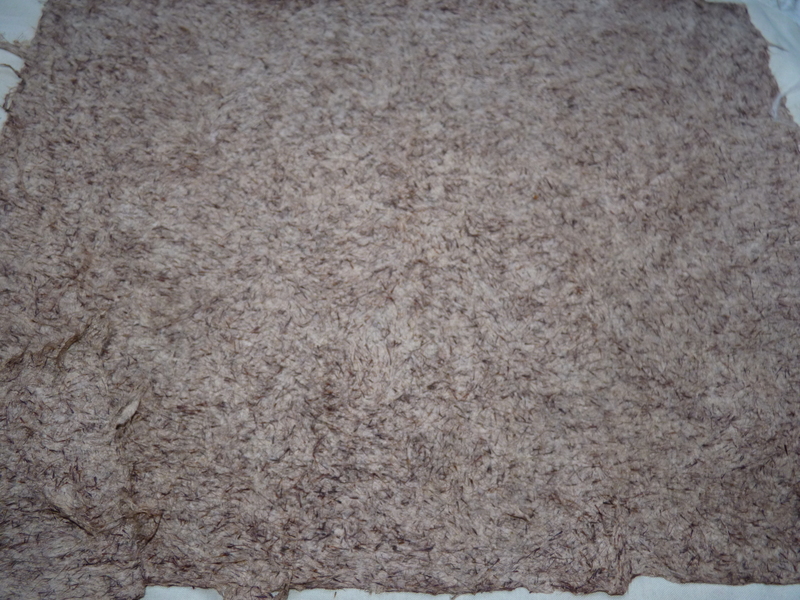 Really serious papermakers doing plant fiber paper actually buy professional blenders that help break down the pulp. But if you are reading this post, my guess is that you aren’t that serious yet . 2) Add your fibers to a vat of water (we are using the pull method for this, as detailed in my last post). 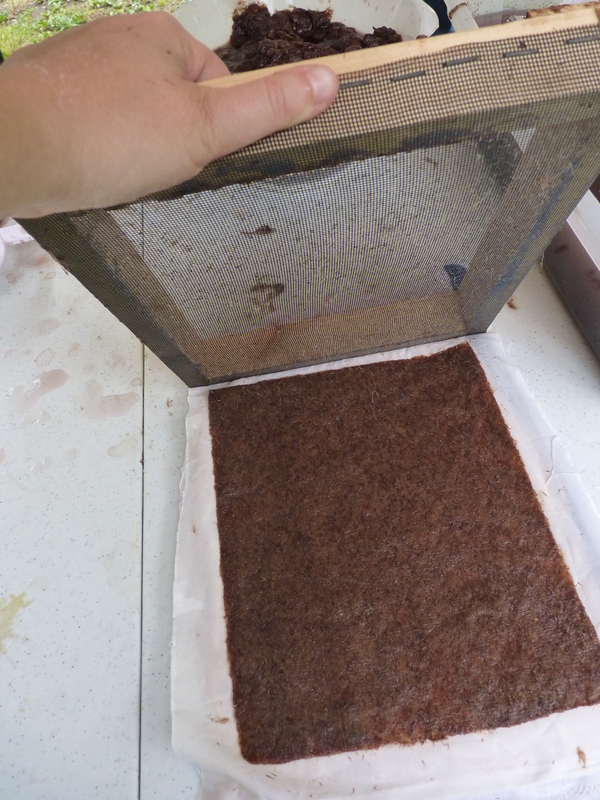 3) Pull your sheets of paper out of the vat using a mould and deckle. 4) Couch your sheets of paper. Please note that some plant fibers are really hard to couch effectively—and even harder to peel from a sheet of newly pressed paper sheets (this is when you stack the couched sheets on top of one another). Because of this, I suggest that you stack and press no more than three of them. If you have trouble pulling the pressed sheets apart, simply don’t press them at this stage. Just take a sponge and soak out as much of the water as you can. Not pressing them to remove excess water means that they will take a lot longer to dry, but you’ll end up with nice sheets. I had this problem less with cattail than I did with burdock and phragmite. I found that if I pressed only a few sheets of paper, and didn’t press too much water out of them, they didn’t stick too badly. 5) Let your paper dry, then enjoy! You can iron your paper or press it overnight to get it to flatten out. Natural Cottage Project Workshop – The Sauna Addition !